This guide was originally published in December 2016 as an extensive, single-page guide to vinyl replay. Having realised just shy of 4 months later that the guide was in fact far too long to be digested in a single sitting, and owing to its poor performance in the search results, I decided to publish it instead as a series of content. The contents of the guide remains mostly unchanged besides a couple of minor edits, though parts of it may be altered in time with updated or expanded information. Christmas 2016 is almost upon us, and with it the Christmas shopping season whereby millions of customers flock to high street and online retailers to purchase gifts for their loved ones, friends, colleagues and the inevitable workplace secret Santa. All manor of goods will find their way to beneath the millions of Christmas trees around the globe, and thanks to the rising popularity of the vinyl format over the last few years it’s probably safe to assume that there’ll be a few records among them. Perhaps, if you’re really lucky, you’ll land yourself some equipment on which to play your shiny new disks or even your cherished collection of old LPs, gathering dust in a cupboard or attic. This article was inspired by a recent feature on channel 5’s ‘The Gadget Show’, in which the team along with Radio 1 DJ Adele Roberts were attempting to discover how much cash you should shell out on a turntable to get good sound. 3 Turntables were tested, including the £159 Pro-Ject Elemental, the £995 ClearAudio Concept MM and a high spec Linn LP12, all running into a pair of B&W 802D3 speakers via a pair of Classé CA-M600 power amplifiers and a CP-800 preamplifier. While at a total cost of £33850 (excluding the turntable) this is unlikely to be a system owned by all but the most dedicated music fans with money to burn, it did demonstrate a clear difference between the 3 turntables, even if the £17220 LP12 wasn’t the deck I would’ve picked for a true demonstration of what vinyl is really capable of. The feature did raise an interesting point however. The amount of information concerning vinyl playback is simply staggering, and the number of products on the market is overwhelming. I decided to assemble this guide to turntables and vinyl playback not only to help new buyers make an informed purchase decision, but also to help you get the best from the equipment you have. Sound is the vibration of air and particles across a medium in the form of waves. In 1877, Thomas Edison developed a way to imprint the electrical signal of a sound wave onto a piece of tin foil, etching the signal with a needle. A needle could then be used to read the etching, reproducing the original sound waves via an amplifier and speaker. Emile Berliner would later use the same technique to record sound to discs first made of rubber and later shellac, the predecessor to vinyl and the material from which most 78RPM records are made. Modern vinyl records operate on the same principle. 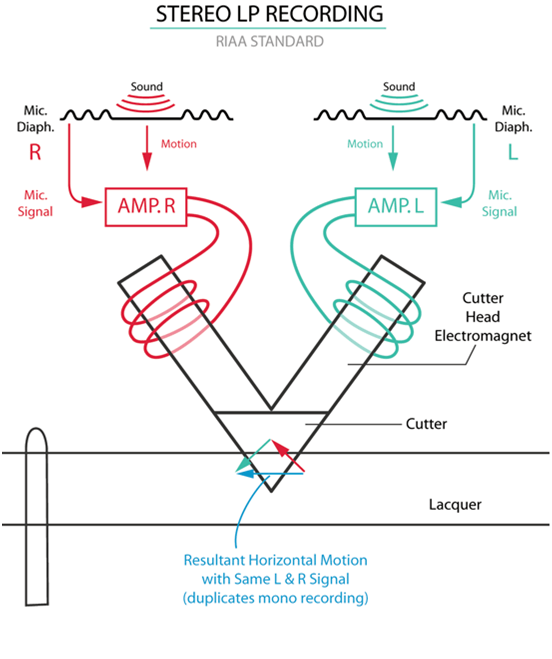 A cutting lathe is used to convert the electrical sound signal into vibrations via a cutting head, a device not unlike a phono cartridge operating in reverse. These vibrations are etched onto the master blank – an aluminium disc coated with an acetate plastic. The heated Safire stylus of the cutting head glides through the acetate, etching the vibrations in a single continuous groove producing 1 master disc per record side. When they reach the pressing plant, acetate discs are plated with a thin coating of conductive silver. Once plated, a thick, heavy layer of nickel is plated onto the disc. If plated with the one-step process, the nickel plating is often made thicker with a second plating stage, at which point it is separated from the master to form the metal master, a direct negative image of the original master. In the two-step process, the nickel stamper created from the master disc is covered with a thin layer of plastic or grease, silver-plated once more and re-plated to create a second disc, known as the metal mother. The mother is then repeatedly re-plated to make multiple stampers, and the master kept so that new metal mothers can be made. 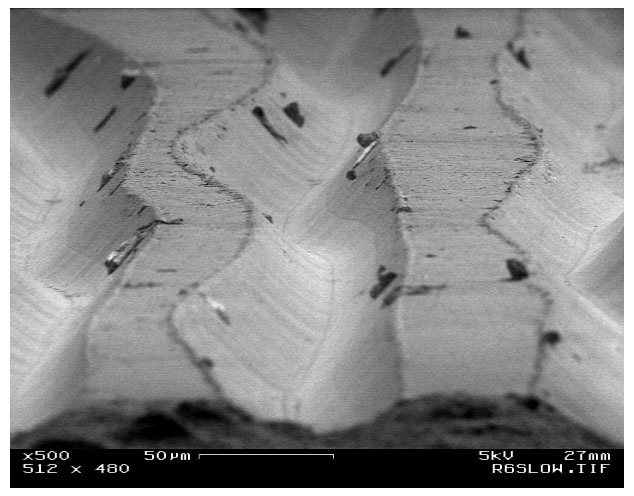 Many more discs can be created using the two-step process, though large runs come at the expense of sound quality due to the multiple stages of plating involved. A stamper produced using the one-step process is usually limited to around 1500 pressings, though many pressing plants produce only a thousand or so to avoid sound degradation as the stamper wears. Masters can also be created using a copper disc instead of aluminium and acetate, known as DMM mastering. The advantage of a copper disc is that it need not be silver plated as it is already conductive, and a huge number of stampers can be produced from a DMM plate as it need not be discarded after use like the aluminium acetate disc. The stampers created during the process above are used to press the vinyl record. A hole is punched directly in their centre, and they are played back on a turntable with a v-shaped notch in its stylus to test for any pops and clicks which are repaired by hand. The stampers are secured onto the pressing plates of the machine, and a bottom label, vinyl biscuit and top label placed upon the bottom stamper. The stampers are then quickly heated using steam and pressed together, squeezing the vinyl out across the stamper surfaces. While the vinyl is being pressed, a blade runs around the outer edge to trim the vinyl into a perfect circle. The stampers are then cooled with cold water, and the finished vinyl discs are removed ready to be packed and prepared to leave the pressing plant. This article is part of our Guide to Turntables and Vinyl series. Continue reading: Part 2, The Components of a Turntable. Hi, Ashley. I believe the new Re-Loop Turn 3 is a version of the Teac TN-300, by I’m not sure. Anyway, between the AT-LP5 and the Teac TN-300, which would you recommend for a two-channel system? I listen to classical, jazz, and swing. Thank you. The AT-LP5, with an AT440MLB if you have the budget.